Despite the swings in temperature from -10C one day to +10C a few days later, spring does seem to be about in the garden with the earlier bulbs now blooming in the open. 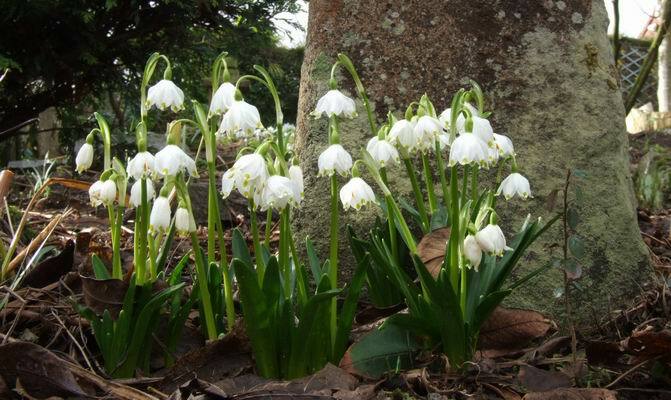 In these days of frenzied galanthophilea, as the founder of the Leucojock movement, I always like to speak up for the Leucojums. I am sure if we looked at the snow flakes in the same minute detail that we look at the snow drops we would find minute variations that would allow us to start throwing dozens of names around for them as well. 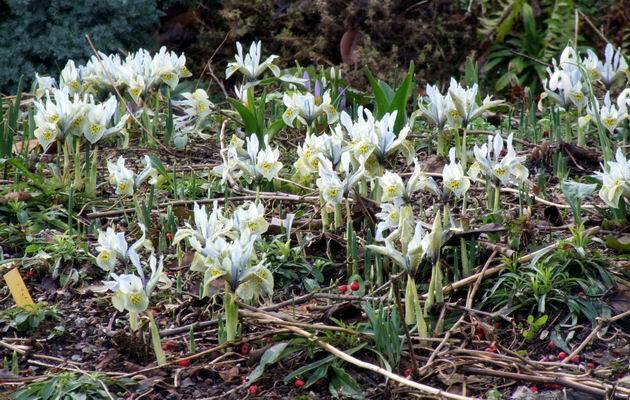 They are beautiful spring flowers and, just like snow drops, no garden should be without them. Do not be fooled by the delicate look of the reticulate irises they are as tough as they come and the flowers, even when fully out, will survive several days under snow and emerge undamaged when the snow melts. The masses of rice grain bulbils that they produce mean they form dense clumps of flowers quite quickly. It is difficult to appreciate the individual beauty of the flowers when they are crushed together in clumps like that so I split them frequently, planting single bulbs over an increasingly wider area. I have noticed a lot of the Iris 'Katherine Hodgkin' I am seeing at shows display dark blue flashes in the flowers which I fear is a sign of virus - fortunately all of ours look to be free from infection. I have pots of ungerminated colchicum seed going back several years - they certainly amount to my biggest failure in growing bulbs from seed. However a few have germinated for me like this Coclhicum hungaricum, a neat little spring flowering species which I am tempted to plant out into a raised bed - we also grow a white form which we bought in. In the bulb house the left hand bench is dominated by the colours of the crocus just now, even though Narcissus 'Cedric Morris', which has been in flower since mid December, is still looking fresh. The extended leaves of some of the autumn flowering crocus species can be seen in the middle of the right hand picture. I showed a picture of the outside of the Crocus abantensis flowers last week and they opened beautifully in the few hours of sunshine we enjoyed. They are a real gem of a colour and if you do not have this species you should place it on your wishlist. As can be seen from the right hand picture, we also grow it outside in a raised bed, where it is perfectly happy. Likewise Crocus sieberi sieberi opened its flowers, revealing the fantastic frilly orange stigma which contrasts so well with the white petals and yellow throat. I have never tried this one outside and have struggled to keep it going previously but, hoping I am not speaking too soon, we seem to be getting a steady increase now. Also it has set good seed in recent years and we have a few good pots of seedlings coming along so I may yet try one of these outside. 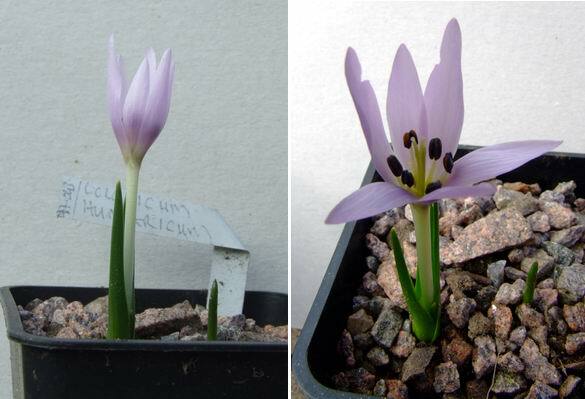 Two more: on the left is Crocus etruscus and on the right sieberi nivalis, both of these grow well in a warm well drained position outside. We are also in the second flush of the Narcissus flowers with many more Narcissus romieuxii types coming into flower now. From the right we have the pale yellow, free flowering SF 151 Narcissus mesatlanticus x romieuxii, to the left of it is my short form of Narcissus romieuxii (which I spoke about last week, it had self-seeded into the plunge) then the deep yellow JWB8913 Narcissus romieuxii and on the left the very beautiful crystal white, sweetly scented, SF16 Narcissus cantabricus occidentalis. 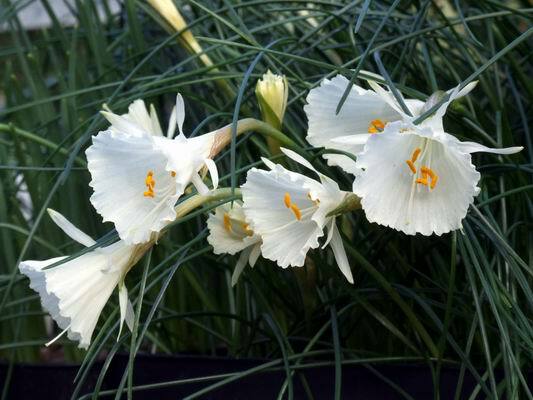 This is one of the gems of the hoop petticoat narcissus with everything that you could ask for: good looks, lovely scent and it increases well. regrets in buying the Fuji and, while I have decided to hang onto the Olympus as well, if I had to choose only one then there is no contest, it would be the Fuji with the versatility that the 28 to 300mm lens brings to my pictures. Just to point out that Frit time is just around the corner this Fritillaria karelinii is flowering for the first time, from seed sown in September 2001. Having told you all that a grey back ground is the best for photographing plants: there are occasions when black or white is called for! You just have to be aware how using these will affect the auto exposure of your camera and make the necessary adjustments so your subject is correctly exposed.